All Replies on Shop trash can? Metal trash can with lid for me. A little more fireproof in case of accidents, and the lid shuts off oxygen in case of problems. Neighbor had a fire in his garage shop using a cardboard box as trash can. He has no idea how it started, caught it quick and just a little smoke in the air. Big empty dog food bags. Years ago, (and extending over a period of years) I remodeled an old house. Had to tear out lots of lath and plaster, which I came to loathe. We bought our dog food in 50 lb. bags in those days (2 big Irish setters). I would fill a bag with plaster, then walk backwards into the super market through the exit doors, and place the plaster on the dog food display. Hmmm … so you’re the one who killed my Schnauzer! 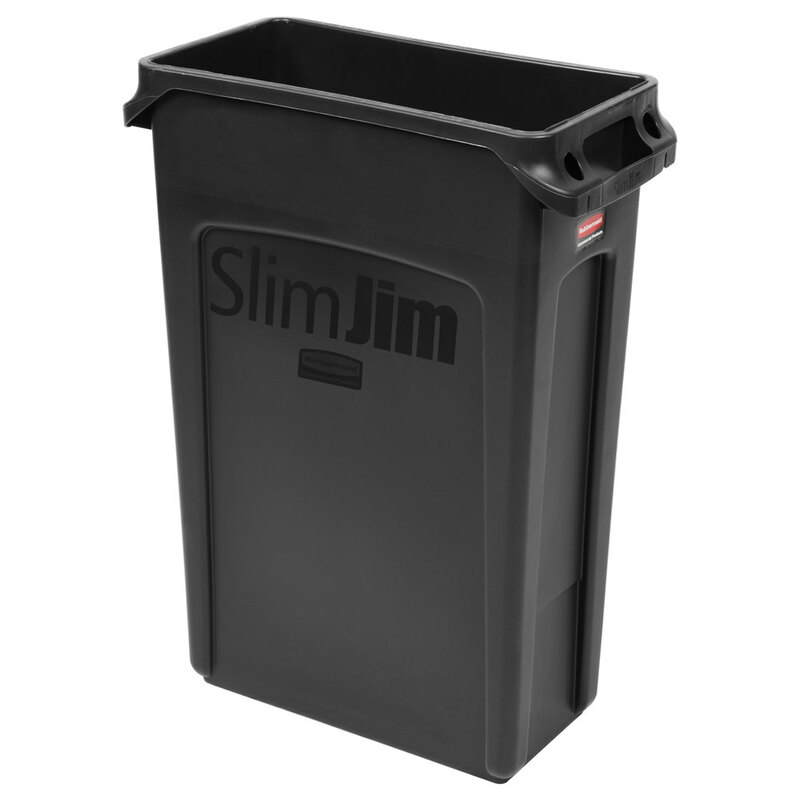 I use two narrow bins called Slim Jims made by Rubbermaid. Very similar to what jimintx suggested. I like them because being narrow they fit well at the ends of benches etc. Much nicer having two smaller ones near work areas than one large one. This has been a fun topic. Who’d have thought it wold go this long? It is clearly a “to-each-his-own topic”, too, which is what makes it all the more interesting. I bought my set of four Rubbermaid Commercial Products Standard Series 10.3 Gal. Black Rectangular Trash Can at home depot for $7.97 each, and they are still shown at that price. For me, I am not going to improvise or build my own containers when I can get these at that price level. Being plastic they are impervious to most any yuck and moisture, and are easy to rinse with a hose. If it is really messy I can squirt in some soap. I find it is very easy to slide them around the floor with the shove of a foot. I do empty the trash weekly. I pick up one and go empty the others into it. I doubt the accumulation ever weighs more than 10 pounds, more likely 2 to 3.
d38, thats a good method! 13 gallon kitchen trash can with lid. 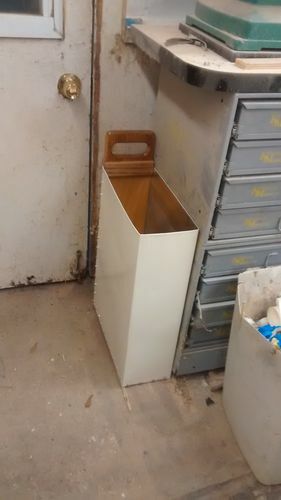 I throw a contractor grade black plastic bag in the can first, then when the can is full the bag still has room and I can go around the shop and pick up the cr…stuff I was too lazy to throw away in the first place. Ron – I have extreme envy of your interesting drill press. I have never seen anything like it before. The ideas this thread has spawned is great. I’m currently using a huge rubbermaid barrel of 1994 vintage which is about to wear out. And you guys are right. It is too big. 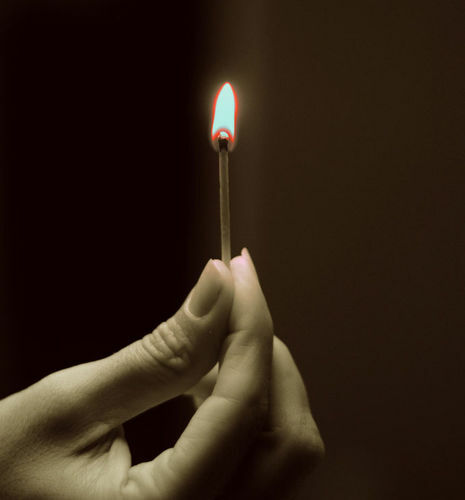 I like the idea of the much smaller ones and just having several. And I’ll be checking on that “slimjim” one to see if it will fit under the end of my bench. I thought of making one out of plywood scraps, but it seems like a waste (pardon the pun). Moving box is a good idea. And plenty cheap at HD. Probably cheaper than a real one from Office Depot. But I throw a lot of wet gunk in there sometimes, so plastic would suit me better I think. The timing of this thread is funny. Thank you, sir! It was a lot of fun to build and is a joy to use in my unplugged shop! 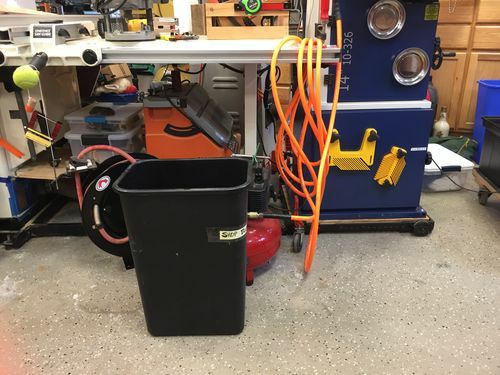 I never had a shop trash can, I always used to go outside to the can where we tossed the household garbage can and threw shop stuff in those. About 2 years ago I bought just a small galvanized trash can that looks just like the large type. I had no idea how much stuff I was throwing out, I have to empty this 10 container almost twice a week. I also have a JustRite Safety Can that has a self closing lid for oily rags. 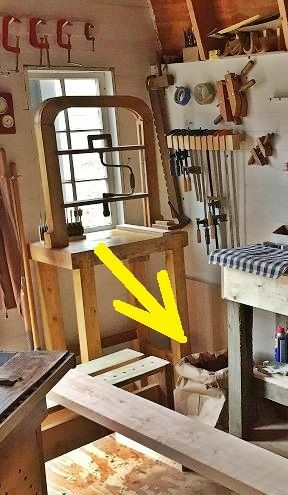 Many years ago I was finishing something with Watco Danish Oil and tossed the old rags in my kitchen trash can. About 2:00 AM in the morning I awoke to my smoke alarm going off. Yes spontaneous combustion does happen. 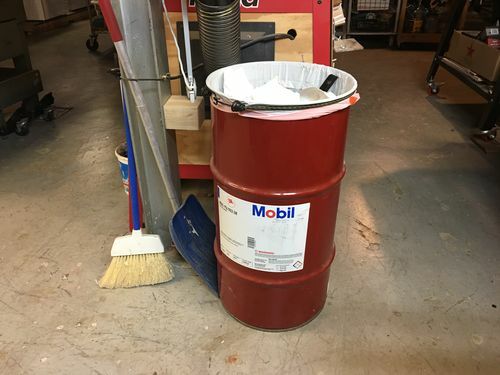 I just use a couple of 5 gallon plastic buckets as trash cans in my basement shop (36’ x 40’). I do have a old wooden box about 3’ L x 2’ W x 2’ T sitting under the right side wing on my table saw. 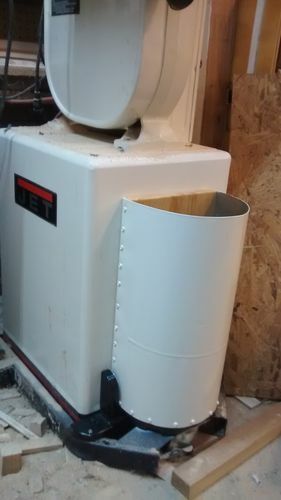 Our wood burning furnace sits in the woodshop so it saves me from getting crushed by saved wood scraps. :-) That furnace is also the destination of most finishing rags etc. even in summer. If it self combusts in there who cares. :-) If it is something I might reuse it just gets tossed to some open area of the concrete floor where it can’t set anything else on fire. For those with bad backs or lifting issues, a friends idea for his 90lb grandmother was genius. Take one old lawnmower and remove engine. Mount bracket or ring to support container. Place container of choice on the lawnmower. When full, roll the lawnmower out to the street. Should work for most of the containers suggested. Only metal cans – that will contain any small fire. Lucky to have a number of old fashion office cans – round, square, oblong. They fit anywhere. Outside in garage I have an heavy duty galvanized ash can abut 30 gal. size and more of the smaller old office cans. Nothing gets transferred to plastic waste collection barrels until garbage night.